Monster Beverage Corp. (MNST) was last reviewed in early August, when we said, "The current advance looks like it can continue and MNST could reach the low $60s. The charts look positive as long as we do not decline below $49." That forecast has worked out nicely, but in this business one cannot rest on their laurels. What do the charts and indicators suggest now for MNST? In this daily bar chart of MNST, below, we can see a nice uptrend in place since early March, but the price action this month is more interesting. The price run-up from $56 looks like the pole of a bull flag formation. The sideways-to-lower price action the past week or so from around $63 down to $61 could be the "flag" part of the formation. Another sharp rally to the upside is what would be expected. Prices are above the rising 50-day moving average line, after several tests in October and early November. The On-Balance-Volume (OBV) line is in an uptrend and confirms the price advance. The Moving Average Convergence Divergence (MACD) oscillator is above the zero line, but poised for a cross to the downside for a possible take profits sell signal. In this weekly bar chart of MNST, below, we can see that prices are above the rising 40-week moving average line. The weekly OBV line is bullish and so is the weekly MACD oscillator. 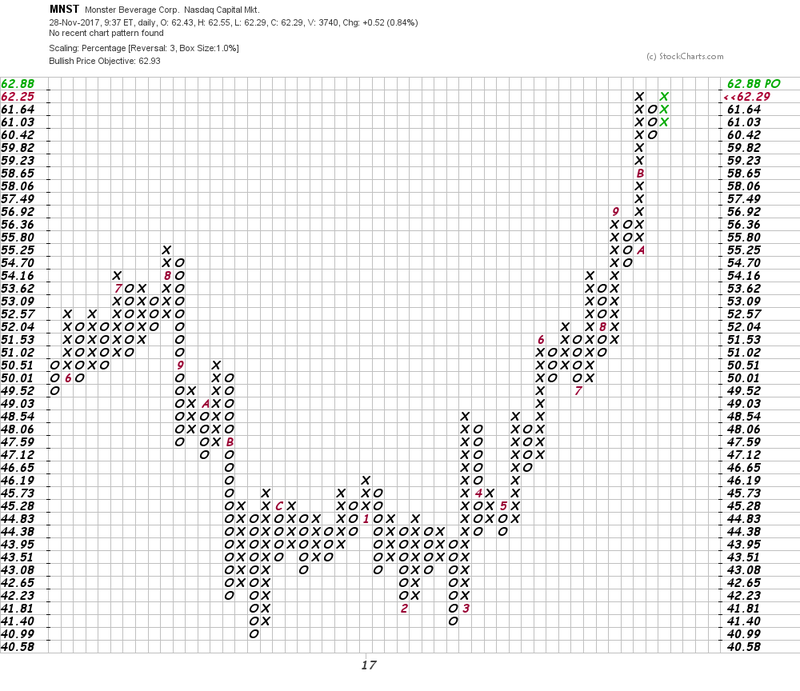 In this Point and Figure chart, below, we can see the uptrend in MNST displayed differently. There is an upside price target of $62.93 displayed, and that could open up further gains. Bottom line: MNST is still pointed up and our indicators are still bullish. Investors should raise sell stop protection to a close below $56 and on the upside we could see further gains to around $70. Drink up.